I was invited to give a lecture to the International Masters Programme in Health Informatics at Karolinska Institute, and we recorded a video of the entire lecture, in total around 3.5 hours. The last part is about iotaMed, our open source project for a “new and improved” electronic health care record, which is knowledge support, medical record, and national registries all rolled into one. The rest of the lecture is about a lot of different things I have opinions about, and as there is no lack of things I feel strongly about, it went almost an hour longer than it should have. The full lecture consists of 12 chapters (“parts”), each 1-4 video segments (YouTube limits videos to max 15 minutes, and that makes for a lot of dividing of videos). You can find the lecture notes here. Oh, by the way, the site for the iotaMed project is here. The playlist with all 20 videos is on YouTube here. I’ve started to do mockups of the iotaPad interface, so I can illustrate the workflow of the iotaMed journal. 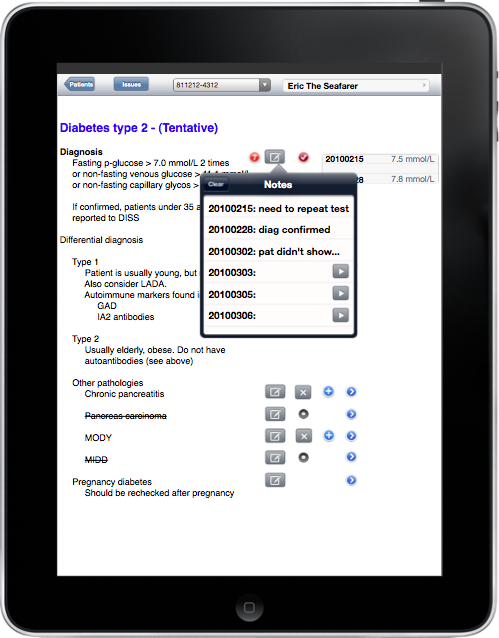 I think those mockups are needed, since it’s very hard to illustrate how a medical record should work, unless you can see it in action.